The FZZ fanzine project existed from 2008 till 2011. This site's hosting is continued as an archive. Form + Zweck used to be the design magazine of the German Democratic Republic (GDR). As the GDR ceased to exist the magazine was continued with much enthusiasm and care by the former editors as an affectionate and enthusiast project, which is self-published up until today. Form und Zweck means form and purpose, and expands the classical modernist credo of form and function. Initially the magazine took up the tradition of the Werkbund and the modern movements ideas of design and translated them into a real- socialist context. We are publishing Form und Zweck Zwei now! It is by no means meant as a continuation of the original Form and Zweck, which still exists. 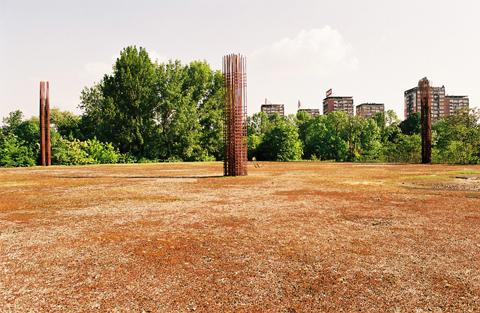 Form und Zweck is flotsam for us, a find, which is is located within a field traced by subjects we are interested in. First of all we are formalists; we love the alliteration of Zweck and Zwei. Secondly, we are intrigued by the relation of form and purpose. Purpose does ask for the aim, asks why? For which purpose? Thirdly we are haunted by the spectres of modernism. In this sense, fzz.cc is a projection-screen for things that we find inspiring; a surface to throw bits’n’pieces on. Shopping Mall unter dem BND! 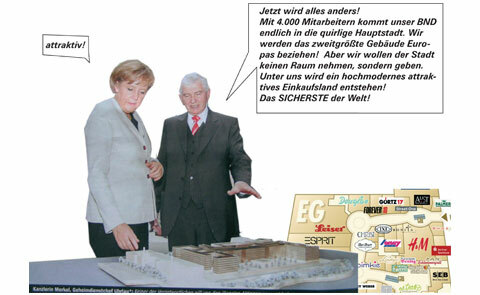 Aus gegebenen Anlass zeigt FZZ exklusiv Ragna Körbys Vorschlag ein Shopping Mall unter dem Neubau des Bundesnachrichtendiensts zu errichten. Der massive Bau steht derzeit in den Schlagzeilen, da dem BND geheimste Baupläne verlorengegangen sind. Die Notwendigkeit der absoluten Geheimhaltung dieses Bauvorhabens erscheint umso absurder als dieses einen hyper-sichtbaren, aber unbetretbaren Megablock ins Stadtzentrum stellt. 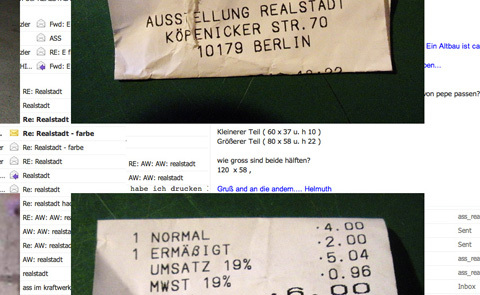 Diesem Widerspruch ist unsere Autorin nachgegangangen. Ragna Körby schlägt vor, eine Shopping-Mall unter dem BND anzulegen. Mit ihrer als "mind urbanism" bezeichneten Strategie konstruiert Körby eine architektonische Hypothese, die Sie dann an der Realität testet, und dieser Idee somit ein Stück weit in die Welt hilft. Der Vorschlag der "Unterlandpassagen" ist mittlerweile schon 4 Jahre alt. 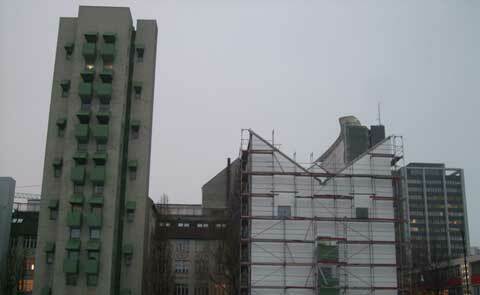 Er entstand als der Baugrund für den BND-Bau noch eine große grüne Brache war, als informeller Stadtpark extensiv genutzt wurde, und "Gelände des ehemaligen Stadions der Weltjugend hieß". Die tagespolitischen Ereignisee aber beweisen, das diese Arbeit nach wie vor hochaktuell ist. Wir freuen uns aber auch ganz besonders endlich Körbys Unterlandpassagen hier zu präsentieren, da dieses Projekt die Initiierung von FZZ maßgeblich inspiriert hat. 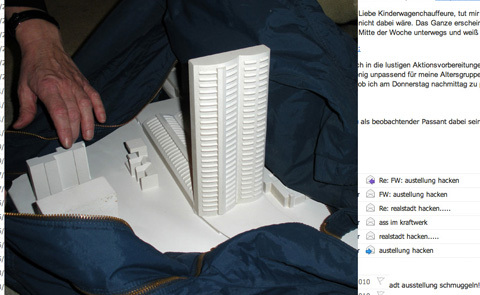 English Summary: Ragna Körby proposes an underground shopping mall beneath the new headquarters of the German secret-service in Berlin-Mitte. The service has recently been exposed to a small scandal because top secret construction plans have been lost. Large parts of the building now have to be re-planned. Although Körbys work is already more than four years old, the scandal affirms it's actuality. The Collage will be included in Sanders book "Fietstocht van Amsterdam naar Berlijn" (bike tour from Amsterdam to Berlin) which will publisehd soon by Tollwut in Amsterdam. A.S.S. (architetti senza sensabilitá) als Kunst- und Architekturformation verfolgt seit längerem die Strategie der unkomplizierten Ergänzung bestehender Systeme durch unautorisiertes Hinzufügen integrierbarer Komponenten. Ohne Schaden anzurichten und ohne weiteres Aufsehen zu erregen, fügte A.S.S. unter Zuhilfenahme von gepolsterten Mänteln und dazu geladenen - Deckung gebenden - Kollegen der bestehenden Ausstellung „Realstadt“ ein Städtebaumodell hinzu. A.S.S. hofft, dass die Veranstalter die unaufgeforderte Ergänzung ihrer Ausstellung mit einem angemessenen Augenzwinkern absegnen und als produktive Bereicherung verstehen. The art and architecture formation A.S.S. (architetti senza sensibilita) has been pursuing for some time now the strategy of supplementing existing systems by means of the unauthorised addition of integratable components. Without harming anybody or causing a stir, A.S.S. 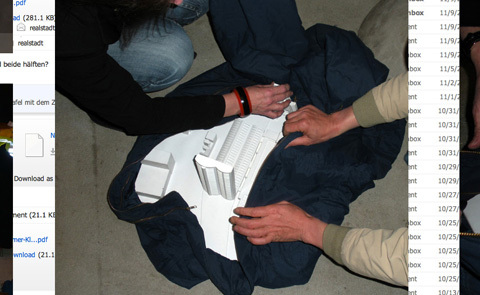 has added a city planning model to the “Realstadt” exhibition currently showing in Berlin, with cover provided by padded coats and invited colleagues. A.S.S. hopes that the organisers of the show will give their blessings with an appropriate wink and understand the action to be a productive enrichment. 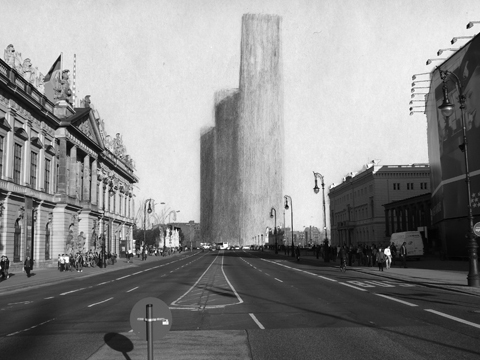 After the Prussion castle has been re-erected at last, an initiative will ask for the final reconstruction to fill the last gap in Berlins history of architecture: An info-shop promotes the reconstruction of Albert Speers Neue Reichskanzlei in Berlin Mitte, on Marx Engels Forum. A performance lecture on reconstruction, a nationalist discourse on architecture and the attempt to rehbilitate fascist architecture. 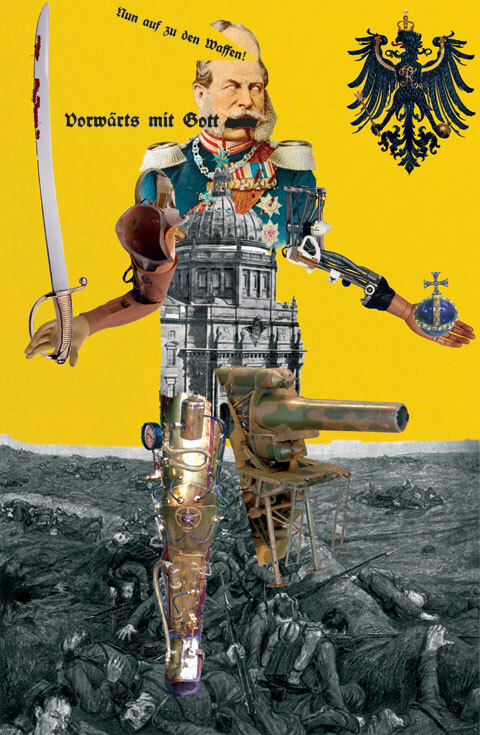 Protagonists of the Berliner debate on architecture and specialists of reconstruction and "Prussian architecture" , like Hans Stimmann, Hans Kollhoff or Vittorio Lampugnani will have their say. A sausage, black bread and pickled gerkin model gives a demontrative impression of the project. The IBA tower by John Heyduk is currently being ruined by an investor reports slab magazine and Jim Hudsons blog: http://www.architectureinberlin.com/. 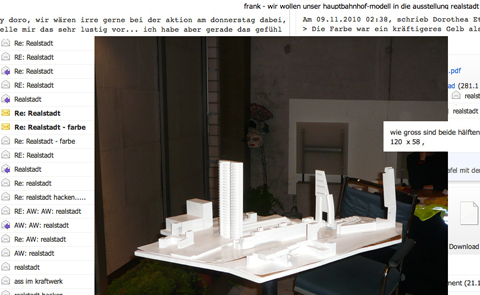 website on the diploma project by Robert Burghardt proposing a monument for modernism in Berlin. 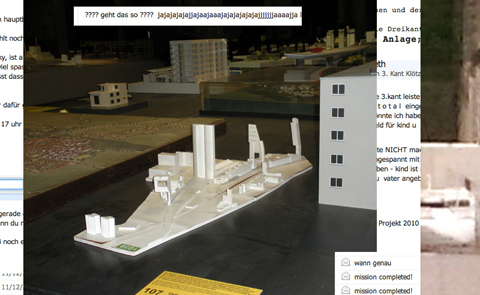 A recollection of the Berliner architecture discourse for non-German speakers. 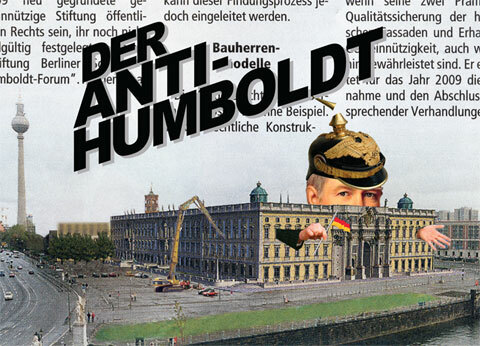 After the resolution of the Bundestag in 2002 and the completed demolition of the “Palace of the Republic” in 2008, the new construction of the Berlin City Palace, including the Humboldt Forum planned inside it, is taking shape – until now largely unnoticed by the general public. 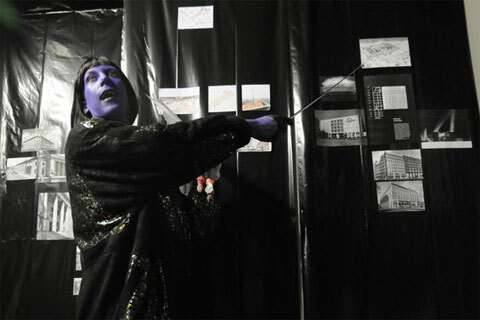 An evening event with lectures, artistic contributions and statements unfolding the “palace problem”. So that the possible willingness of the audience to commit themselves against the palace problem doesn’t disappear without a trace in applause, and for us to be able to delve into the complicated matter, we would like to offer workshops with four thematic focuses on the next day: colonialism and restitution; Prussianism and cosmopolitanism; cultural nation and humanism; ethnological museums and the treatment of “non-European” artefacts. These workshops are to be accompanied by members of the group as well as invited guests. 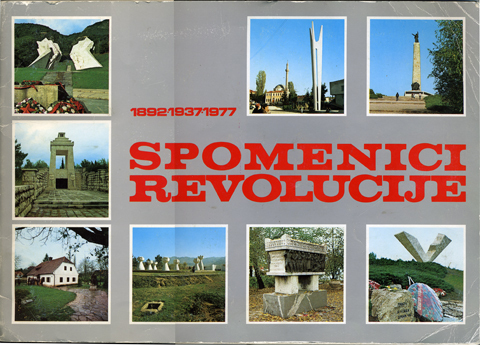 Album for collecting "Spomenici Revolucije"
A friend recently introduced me to this interesting childhood memory of his. Growing up in West-Germany he went to a afternoon class in serbo-croatian where he tradedYugoslav revolution memorial photos with other "Gastarbeiter"-children in a small swabian town near Stuttgart. Relatives from Yugoslavia regularly supplied them with new stickers, keeping the trading business alive. This is the finally unfinished museum of the revolution in New Belgrade between the former Palace of the Federation and the Former Yugoslav Communist Party headquarters. It consists out of a massive windowless cellar covered by a large platform overgrown with moss. Large columns of concrete reinforcement protrude into the sky. 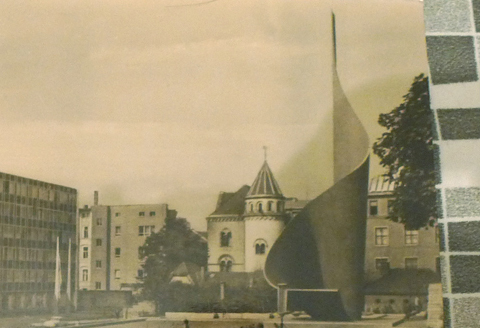 Another proposal for Berlin's Schlossplatz. A monument for modernism. 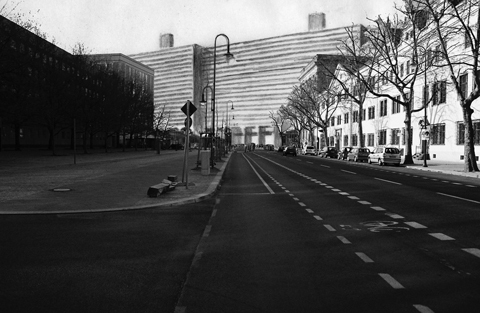 A functional, yet iconic building for Berlin's centre. Co-operative housing including public functions like workshops, canteens, a city library and a swimming pool. Here, the view from Unter den Linden. The view from Breite Strasse.